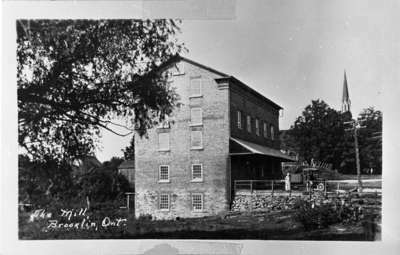 A black and white photograph of Brooklin Mill. There are two men standing near a truck outside the mill. The men standing by the truck are: Charles Wilson, owner of the mill and William Parrinder. The Brooklin Mill was built in 1848 by Robert Campbell. This picture shows the east side of the mill.